Characteristics: Rule, manipulate your discard pile, -icon. Requires: affiliation, Ferengi species, Freighter Class, Transport. 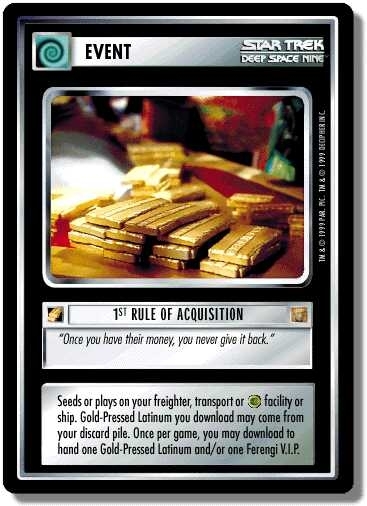 There are 27 entries for 1st Rule of Acquisition (ST1E 8 C 22) at the Tradeplace (77 haves and 5 wants). Click here to see all trade list entries for this Common card!